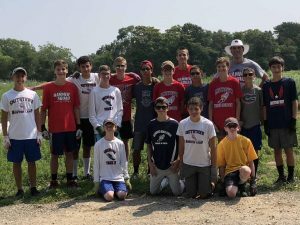 Photo caption: Members of the Smithtown Central School District’s boys cross-country team recently volunteered their time at Island Harvest’s farm in Brentwood. Joined by coaches Peter Schieck and Mark Jackett, the boys learned about Island Harvest from staff member Hillary Hess. 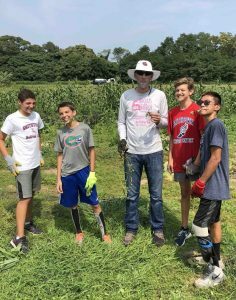 The team helped pull weeds in between the rows of vegetables and harvested some zucchini and eggplant. Island Harvest is the largest hunger relief organization on Long Island, serving more than 300,000 Long Islanders annually, including adults, children, families, seniors, and veterans, through their network of approximately 570 food pantries, soup kitchens, and other emergency programs.